Carving and sculpture in wood and especially low relief, traditionally related to sacred art or furniture building, can and must also find other possibilities, new projects and contents, be they figurative or abstract, simple or in association with other materials or colors. 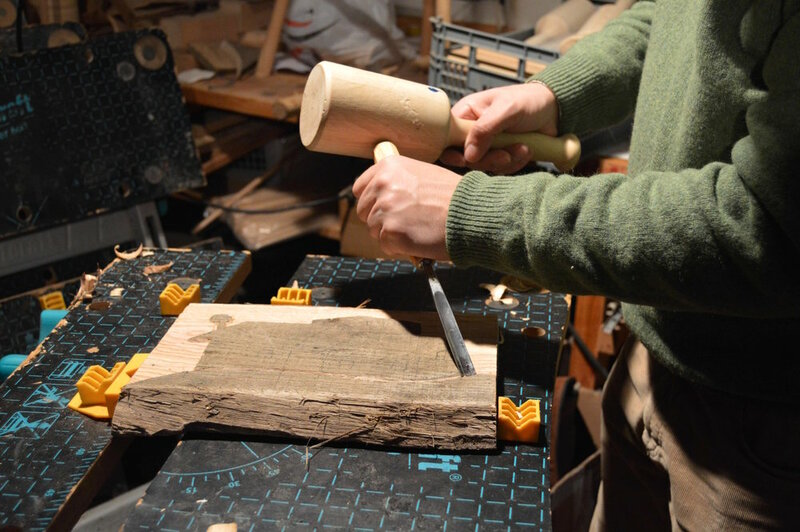 This course is a creative approach to woodcarving as a means of personal and artistic expression. Following an introduction to the techniques and raw materials, each participant will formulate his own project, guided and supported by the teacher in an atmosphere of friendship, cooperation and mutual aid among all participants. There will be work inspired by your stay and experience in this special place or projects that you have dreamed of carrying out for a long time - low reliefs or small sculptures that tell us stories - in wood. Sweet chestnut wood (castanea sativa) will be our main, but not exclusive, raw material, an autochthonous wood, dense, slow growing, resistant and durable, beautiful and homogeneous. Working with wood is a constant dialogue between the artist and the raw material that, due to its characteristics, does not allow us to "easily" impose our ideas, requires communication, commitment, sensitivity and technique. At the end of the course you will take home an excellent piece, resulting from this dialogue, your creativity and the learning experience that this course has given you. To see and think creatively. Kerstin Thomas, sculptor for almost 30 years, studied wood carving and sculpture in her home country, Germany. Once in Portugal, she studied Portuguese Language and Culture at the Language Faculty in Coimbra University. With a preference for autochthonous wood, her work is inspired by rural life and the expressiveness of the human face. The construction of the Sasukenei-Smokeless Kiln for high temperature wood fired ceramics in 2015 was the beginning of finding in ceramics a new way of artistic expression. Co-founder of the Cerdeira-Home for Creativity project, she divides her time between her art practice and her work as coordinator of the village's Artistic Program. Renato Costa e Silva, ceramicist and sculptor, with 40 years of professional activity has a vast curriculum not only in the area of ceramics but also of large public sculpture in various materials. Born in Angra do Heroísmo, Azores, he lives and works in Angra and Cerdeira. He has carried out an intensive study of clay and ceramic materials and has a long experience in the preparation of ceramic pastes and glazes. Over the years he has conducted hundreds of wood firings. We also offer this workshop as a creative experience of 3 hours in woodcarving (you can book it with your accommodation).